For nearly 70 years, Green Clinic has cared for families in our community. Today, our goal is to make our commitment even stronger and focus on giving our patients quality healthcare. When you need a doctor, you only need to remember two words: GREEN CLINIC. 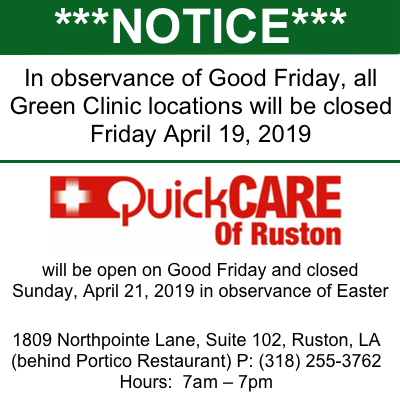 GREEN CLINIC'S MAIN CLINIC LOCATED AT 1200 S. FARMERVILLE STREET WILL REMAIN OPEN TODAY.